The avocado is a tree native to Central America and Mexico and classified in the flowering plant family Lauraceae. The avocado fruit is also referred to as the fatty fruit of the avocado tree, which is known as Persea americana in the scientific circles. Avocado is rich in monounsaturated fats, which make its texture creamy and smooth. Compared to most other fruits, avocado is much higher in fat. Avocado can be said to have a unique nutrition profile if you take into consideration the fact that it contains a lot of fiber, vitamins and minerals such as vitamin K, vitamin E, vitamin C and B-vitamins, potassium, and copper. The consumption of avocado has been linked with numerous health benefits and one of them is the reduced risk of cardiovascular disease. Due to its potent nutritional profile, it is very satiating, thus helpful for weight loss. As for eating avocado, it can be eaten raw, but can also be prepared and used in foods such as guacamole. There are various types of avocado that are different in color, shape, and size. On first glance, you may confuse it with pear because of its shape and the fact that it comes in many different tones of green, ranging from light green to black when fully ripe. The most popular type of avocado is Hass avocado, which is round in size and black in color. The word “avocado” is said to be derived from the Nahuatl word “ahuacatl”, which means “testicle”. Obviously, it describes the fruit shape and likely refers to the potency of avocado, which is believed to be aphrodisiac. The Mesoamericans had discovered this fruit and avocados have been a part of the Mexican diet for a long time. According to some archaeological evidence, avocado consumption goes back almost 10,000 years in central Mexico. Later, the tribes such as Maya and Olmec domesticated this tree and grew their own avocado fruit. The first Europeans ate avocados in the 16th century. It was Spanish explorers who consumed this fruit first among all other Europeans. The Spanish had their own word for the fruit: “aguacate”. Thanks to the Spanish Conquest, avocados became widespread through Mexico, Central America, and parts of South America. Eventually, the Spanish brought avocados to Europe. When people in Europe and North America got to know this fruit, they could describe the three main types of avocados: Guatemalan, Mexican, and West Indian. George Washington once described finding and eating avocados in the West Indies and later wrote that the “agovago pears” were a popular food. The word “avocado” is believed to have originated as a word coinage that was formatted by Sir Hans Sloane, an Irish naturalist, in 1696. Florida was the first place to plant avocado in the U.S.; this occurred in 1833. However, it took almost a century for avocado to become a commercial crop. Even though avocado was popular in California, Florida, and Hawaii, it was avoided in other states. Since the 1950s, avocado has been gaining widespread popularity. Avocado consists of 73% water, 15% fat, 8.5% carbohydrates (mostly fibers), and 2% protein. Half an avocado (which is 68 grams) contains 109 calories, which is equal to 160 calories per 100 grams. The following table allows you to take a look at the data on all the nutrients in avocado: (1). Avocados contain small amounts of sugar in comparison to other fruits. Half an avocado (68 grams) contains only 0.5 grams of sugar in three main forms: fructose, glucose, and galactose (2). The net digestible carbs weigh only 1.8 grams for each 100 grams of avocado. Due to the low sugar content, avocados are expected to have a very low glycemic index score, meaning that they should not raise blood sugar levels to a great extent (3). Fiber is the most present carbohydrate content (79%) of avocados. Half an avocado provides a substantial amount of 4.5 grams of fiber. Dietary fiber plays an important role as a dietary component and brings about many health benefits. It is capable of regulating appetite, feeding the friendly bacteria in the gut, and reducing the risk of many diseases (4, 5, 6, 7). Avocado also contains FODMAPs (fermentable oligo-, di-, monosaccharides, and polyols), which stands for short-chain carbohydrates that some people are intolerant to and cannot digest(8). Not everyone is intolerant to FODMAPs, but certain unpleasant digestive symptoms may occur if you suffer from irritable bowel syndrome (IBS). Avocado is a very unusual fruit because it is packed with monosaturated fatty acids, which are not that abundant in other fruits. One of the most abundant fatty acids is oleic acid and it can also be found as the main component of olive oil. Oleic acid has been associated with reducing inflammation and having beneficial effects on cancer (9, 10, 11). Avocado oil has been reported to be a great source of healthy fats, which is backed by animal studies that suggest it has a protective effect against inflammation, diabetes, and heart disease (12, 13). Avocados are abundant in different essential vitamins and minerals; the most common ones are listed below. Folate (B9): A lot of folate is found in avocados; it is essential for normal cell function and tissue growth, making it an important nutrient for pregnant women (14,15). Vitamin K1: This vitamin is important for blood clotting and may have beneficial effects on bone health (16, 17). Potassium: Potassium is an essential mineral when it comes to blood pressure control and heart health (18, 19). Avocados actually contain more of this beneficial mineral compared to bananas (1). Copper: The Western diet is low in copper and often excludes this beneficial element. Low copper intake may cause adverse effects on heart health (20). Vitamin E: This Vitamin is a powerful antioxidant and can often be found in fatty plant foods that are very rich in this vitamin. Vitamin B6: This is actually a group of related vitamins that are responsible for converting food into energy. Vitamin C: This is an important antioxidant for immune function and skin health (21). Carotenoids: Avocados contain various carotenoids like zeaxanthin and lutein’ these two are beneficial for eye health and can reduce the risk of age-related eye diseases (22, 23). Persenones A and B: These are unique antioxidants that may protect the body against inflammation and cancer (24, 25). D-Mannoheptulose: A type of sugar found in avocados; it has been reported to assist with blood sugar control (26, 27, 28). Avocado is very high in carotenoid antioxidants. Because of this, eating fat along with these antioxidants causes an increase in their absorption into the body. Due to the fact that avocado is high in fat, the carotenoid antioxidants that are found in it are particularly well absorbed (29). It also contains small amounts of Iron, Copper, Manganese, Magnesium, Zinc, Phosphorous, Vitamin A, B1 (Thiamine), B2 (Riboflavin) and B3 (Niacin). All of these contain 160 calories, 2 grams of protein, and 15 grams of healthy fats. Even though it contains 9 grams of carbs, only two of them are “net” carbs, while seven of those are fiber, thus making avocado a low-carb, friendly plant food. Another thing that makes avocado a superfood is the fact that it does not contain any cholesterol or sodium and is low in saturated fat. Because of the low percentage of saturated fat that is found in avocado, many “old school” experts consider it a superfood. There is a misconception about avocados and their adverse effects when it comes to weight loss programs and diets. Some people think that avocados should be avoided in calorie-restricted diets because of the fact they are high in fats. On the contrary, eating and incorporating avocados into your diet is not going to prevent you from losing weight. In fact, adding avocados to your meals will help you feel more satiated, which will eventually reduce your desire to eat more and eat more often. It’s been proven that similar meals without avocados do not cause as much satiety (33, 34). Taking all of this into account, it is clear that avocados may be an excellent supplement to an effective weight loss diet. Plus, what makes avocado a weight-loss friendly food is the fact it is high in fiber, low in carbs, and does not raise blood sugar levels (35, 36). Arthritis has become one of the most widespread diseases in Western countries. It is characterized by progressive deterioration of the joint cartilage. Since it is progressive, it can also be progressively treated. Some of the treatments are supplements made from avocado and soybean oils. Avocado oil (33%) and soybean oil (66%) are primarily used to suppress and finally treat symptoms in people suffering from arthritis. According to multiple studies, these supplements have been reported to reduce symptoms of arthritis, especially in the knee and hip area (37, 38, 39, 40, 41). Potassium is one of those nutrient that most people are lacking in their diet (42). This nutrient not only helps maintain electrical gradients in the cells of the body but it is also beneficial to various important body functions. Avocados are very rich in this nutrient. 100 grams of an avocado (3.5 ounces) serving contain 14% of the RDA. Banana, which is considered a typical high-potassium food, contains only 10% of potassium (43). In some studies, it is proved that having a high potassium intake is associated with reduced blood pressure, which is a major risk factor for heart attacks, strokes, and kidney failure(19). Reduce total cholesterol levels to a great extent. In one of the studies, it was proven that incorporating avocado into a low-fat vegetarian diet led to improvements in the cholesterol profile (51). Even though these results are promising and encouraging, the studies that were conducted on avocado and its benefits were small (13-37 patients) and short-term (1-4 weeks). Nonetheless, you should not overlook the impressive results. Many people struggle at keeping up with healthy dietary habits. Not many people are aware of how many fruits can improve their health. One of those fruits is avocado. The study conducted on 17,567 participants in the NHANES survey in the U.S. showed that avocado consumers were much healthier than people who did not eat avocado. Due to its high nutritional values, avocado helped those people to have a much higher nutrient intake. This helped in reducing the risk of suffering from metabolic syndrome – a cluster of symptoms that are a major risk factor for diabetes and heart disease (52). Also, people who were eating avocado on a regular basis were reported to lose weight, have a lower BMI, and significantly less belly fat. Furthermore, these people also had more HDL (the “good”) cholesterol levels. Nevertheless, once again, these results are no guarantee that avocado is the real causation of health improvements. Still, it takes time for avocado to become a recognized and acknowledged health supplement. When it comes to a number of nutrients, it is not the only thing that counts. Some plants are very rich in many nutrients, but their ability to absorb them is not that great. The ability to absorb nutrients from the digestive tract and into your body is what makes these nutrients count. Some nutrients are so-called “fat soluble”, which means that they need to be combined with fat in order to be used and utilized. Fat-soluble nutrients are vitamins A, D, E, and K, as well as antioxidants like carotenoids. One study proved that adding avocado or avocado oil to a meal, salad, or salsa may increase antioxidant absorption by 2.6 to 15-fold (53). Besides the fact that avocado is highly nutritious, it can also dramatically increase the nutrient value of other plants that you eat by being incorporated into your diet. Avocado is an excellent fat source and this is the reason for including it in your healthy vegetarian diet. Without fat all other nutrients may go to waste. Not only does avocado help you with antioxidant absorption from other foods, but the fruit is also rich in antioxidants itself. Some of the antioxidants found in avocado are Lutein and Zeaxanthin, which are essential for eye health and eyesight (54, 55). Some studies have come up with the results where these antioxidants are linked with the reduced risk of cataracts and macular degeneration, especially common in the elderly (56, 57). As a result, eating plenty of avocado will provide your body with benefits for your eyes over the long term. According to one study, avocado is a great choice for pregnant women because it contains a great amount of folic acid, which is important for preventing birth defects such as spina bifida and neural tube (58). The B vitamin is essential and this is the reason why doctors recommend high amounts of avocado intake before and during pregnancy. Avocado contains around 45 mcg of folate per half-cup; more than any other fruit. Vitamin K is yet another valuable nutrient for pregnant women. Luckily for moms-to-be, it is also found in high concentration in avocado. Deficiency in vitamin K causes bleeding, or VKDB, which is a condition where newborn babies cannot stop bleeding because their blood does not contain enough vitamin K. Eating more fruits that contain vitamin K during your pregnancy can help you pass more of it to your unborn child. If you are suffering from fatty liver disease, avocado can help you because it contains healthy fats that can improve your cholesterol profile by lowering LDL (the “bad” cholesterol) and raising HDL (the “good” cholesterol). Avocado has the ability to produce glutathione, a type of antioxidant which is responsible for filtering out harmful substances from liver and protecting liver cells from damage. Those who suffer from the chronic liver disease are often found to be low in glutathione. Eating avocados is certain to increase glutathione levels in your body. Besides glutathione, avocado is also rich in Vitamin C and E, which neutralize free radicals. By neutralizing harmful free radicals, you protect your liver cells from damage. Avocado is also well-known for its anti-inflammatory properties. This is because it contains both Vitamin E and K, two nutrients that reduce cellular inflammation. Liver cell inflammation is preceded by cellular injury. Anti-inflammatory properties of avocado will support your liver health. Consumption of avocado will bring back the freshness in your breath. Many people struggle with bad breath due to indigestion or an upset stomach. Halitosis is the main cause of bad breath, but it can be eliminated by improving digestive health. The antibacterial and antioxidant properties of flavonoids found in avocado help you get rid of bad breath because they have the ability to kill the bacteria in your mouth. Furthermore, avocado has been associated with preventing oral cancers (61). Even though Vitamin K deficiency is not a frequent health issue, it is often observed in neonatal care. It may lead to a bleeding disorder, which is known as Vitamin K deficiency-related bleeding (VKDB). VKDB is mostly caused by an insufficient intake of Vitamin K during pregnancy. Incorporating avocado into the diet of a pregnant woman will reduce the risk of VKDB in the newborn child. This is because avocado is a rare fruit containing high amounts of vitamin K. A single serving of avocado contains 40% of the daily requirements for vitamin K.
Avocado is one of the fruits associated with healthy aging and longevity because of its potent compounds that regenerate your body. One of these potent compounds is xanthophyll, which is a powerful antioxidant. According to one research study, an intake of xanthophyll is likely to decrease signs of the aging process on different parts of your body (30). Avocado contains carotenoids such as zeaxanthin and lutein. These are linked to a reduced risk of cartilage defects – the symptom of osteoarthritis (30, 62). Intake of foods such as avocado, soy, or both may help in lowering the risk of osteoarthritis. A study investigating avocado and its effects on osteoarthritis suggests that 300 mg of avocado or soy supplements appear to be beneficial for patients with hip or knee osteoarthritis (37). Furthermore, the levels of essential minerals in avocados are substantial; they include phosphorus, copper, zinc, and trace amounts of selenium and calcium. Thanks to all of these compounds, the risk of osteoporosis is reduced and improvements in bone mineral density come as a natural consequence. Being an excellent source of enrichment for dry, chapped, or damaged skin, avocado can also heal wounds all over your body. 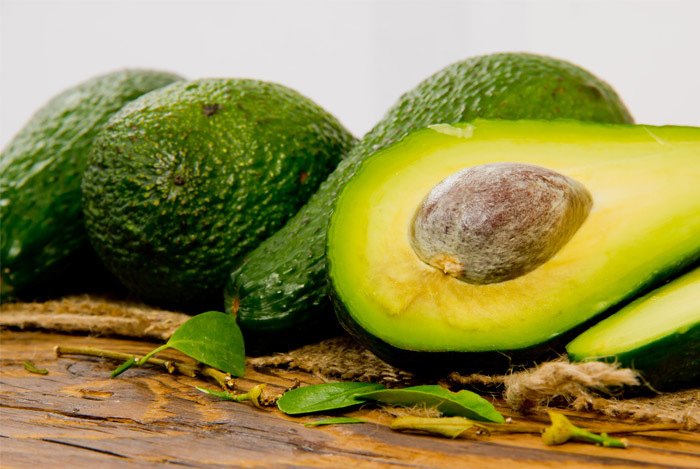 According to a study, avocado has been suggested to heal wounds in rats(63). Namely, the rats were divided into four groups of five and received either topical or oral treatment. As a result, complete healing was observed in the rats who received either treatment type. Avocados contain about six or seven grams of fiber per half-fruit. While everyone’s system is different, it’s usually recommended that women get about 25 grams of fiber per day and men get 38 grams. Eating a whole avocado can mean getting about half the fiber a woman needs every day and about a third of the fiber a man needs. Remember, this much fiber is all from a creamy, smooth, sweet, delicious fruit, not from some bland and dull fiber pill or drink! Many people know that fiber helps to keep your bowels regulated and reduces risk of constipation, but getting enough fiber helps your digestion and overall health in a few other ways as well. One is that fiber helps you to feel full so you don’t overeat. In turn, your weight can stay at a healthy level. Fiber also binds to the “bad” cholesterol in your system and helps to flush it out, so it may even be good for your heart! This, too, is another reason to eat more avocados every single day. Avocados are high in fat, but these are the “good” polyunsaturated and monounsaturated fats that are healthy for your system, not the saturated fats that clog your arteries and are bad for your circulation. The “good” fats in avocados can actually protect your skin. Polyunsaturated fats keep your skin protected from sun damage and inflammation. Monounsaturated fats keep the top layer of skin moisturized so that it’s healthy and guarded from premature wrinkles. The vitamins in avocados, including Vitamin C and E, also protect your skin cells by keeping your skin hydrated. Many people use mashed, raw avocado as a face mask since it contains so many good fats and oils for the skin. Ingesting these oils and vitamins by adding avocados to sandwiches and salads can also protect your skin and keep it looking radiant! The word “lipids” may sound a bit strange, but simply put – lipids are a type of fatty acid. These fatty acids are the building blocks of healthy cells, but they also do much more for your overall health than just restore damaged cells. Lipids are thought to allow your body to better absorb carotenoids or beta-carotenes. Beta-carotenes are found naturally in plants and help the body fight off certain cancers, heart disease, and even cataracts. While you may get carotenoids or beta-carotene in your diet from eating a variety of fruits and vegetables, these carotenoids need to be fully absorbed in your body for them to work as they should. The lipids in avocados help your body absorb this beta-carotene or carotenoids so that they benefit your immune system and keep you healthy. Avocados are high in folate, which falls into the family of B vitamins. You may have heard that pregnant women should get enough folate in their diet, but this substance is good for everyone when it comes to regulating mood. How so? Homocysteine naturally forms in the body, but too much of this substance will block the production of serotonin and dopamine; these chemicals regulate mood, as well as encouraging restful sleep at night. Folate in avocados helps to prevent excessive amounts of homocysteine from forming in your body so that it can produce serotonin and dopamine. In turn, you’re at less risk from depression. Being able to sleep soundly and regularly can also mean a healthier, happier mood, as you’re less fatigued and will have more energy after a good night’s sleep. By eating more avocados, you may see that you sleep more soundly and feel more rested and energetic throughout the day, and have a better mood as well. First, avocado should be eaten when ripe. The only edible part of avocado is the green insides. Use a sharp knife, set the avocado on the cutting board, and cut it in half. Once you have cut the avocado in half, rotate the halves just a little bit so that you can tear them apart. Then, you will have two halves, one of which has the seed. Pull out the seed from the half by sticking the knife in it a little. After that, you will have two identical halves. Now, you need to separate the insides and skin of the avocado. You will do that by running the knife down through the insides. Then take the avocado into your hands and the insides will pop out. This way you will not have any waste. Although avocado is greatly beneficial for your health, you should take into consideration its side effects and be cautious about your daily avocado intake. If you are on a low-calorie diet, you should avoid eating high amounts of avocado because it is a high-calorie food. Furthermore, if you are experiencing symptoms such as mouth itches, swollen tongue, heavy breathing, or stomach pain, you may be allergic to avocado and should seek medical help. If you are allergic to latex, that may be an indicator that you are allergic to avocado because there are findings that suggest a connection between the two. In addition, the risk of being allergic to avocado is increased in case you are allergic to potatoes, tomatoes, bananas, kiwi, melons, or peaches. Also, be mindful when taking medications. If you take Warfarin, an anticoagulant, on a daily basis, it may cause an interaction. For this reason, always make sure to ask your doctor for help prior to eating avocado and mixing it with medications. When it comes to daily consumption, it is recommended that you eat somewhere between a half to a full avocado per day. It is high in calories, which means that eating more than one avocado per day may cause harmful symptoms to your body, such as diarrhea or nausea. Even though it may not seem like much, one full avocado is just enough for your body to get the most benefits from the fruit. The first thing you need to know when buying avocado is its origin. There are two major types and producers of avocados in the US. The produce and its quality may vary depending on your geographical location and on the season. This is why you may find different types of avocado on the US market. If you are going to use an avocado for an immediate purpose, choosing a ripe, ready-to-eat avocado would be the best choice. However, if you are going to buy avocado in advance, it would be better if you buy the firm types and then have them ripen and ready-to-eat at home. You should avoid buying avocados that are overly soft and mushy. This means that the fruit is too ripe. Dark blemishes, bruises, dents, and brown spots should also be avoided when choosing an avocado. If you have a fresh avocado, you can store it in its cut and uncut form. Time will vary when it comes to how long you can store fresh fruit. Be it cut or uncut, ripe or unripe, all of these factors will play a role in how long the fruit can be stored. Cut avocados are naturally susceptible to oxidizing if left unprotected, thus turning brown. You may ask why they turn brown when you cut them. When you cut an avocado, its cellular walls get broken which causes oxidation to occur. However, this process of oxidation can be prevented. All you have to do is add an acidic agent to an avocado and limit the surface area that is exposed to the air. You can limit the exposed surface area by covering it tightly with clear plastic wrap or placing in an air-tight container. Also, leaving in the avocado pit or seed can cause the protection of the surface area exposed to air. Nonetheless, it is recommended that you use the first method mentioned for best results. Store Cut Unripe Avocados – If you are holding a Hass avocado which is unripe, you should sprinkle the exposed flesh of the avocado with lime or lemon juice, place two halves together, and cover tightly with clear plastic wrap before leaving it in the refrigerator. Remember to check the avocado from time to time to see if it has softened up enough and become edible. The ripening process of the avocado will differ depending on temperature conditions and firmness of the fruit. Store Cut Ripe Avocados – In case you want to store a cut ripe avocado, you should first add lemon or lime juice or another acidic agent to the avocado and place it in an air-tight container or some tightly-covered clear plastic wrap. Once you have done that, you can store the fruit in your refrigerator for a day. Store Guacamole – Guacamole is often packed with other ingredients that affect how long and how well it can be stored. For the most guacamole recipes, the method is the same as those mentioned above. Adding an acidic agent on top of the guacamole will prevent oxidization. In order to store and preserve guacamole, you should place it in an air-tight container and wrap the guacamole on the surface before covering it so as to prevent oxidation. Also, you should store it in the refrigerator. In case guacamole turns brown during storage, remove the top oxidized layer. Store Unripe Uncut Avocados – If you want to have your avocado ripen, store it at room temperature for four to five days. You should avoid storing it in the refrigerator because it can slow the ripening. You will get best results if you store unripe fruit at room temperature. Avoid storing it if the room conditions exceed the range of 65-75 degrees F.
Growing an avocado tree is not a difficult thing to do. Follow these simple steps and you will have a successfully planted avocado tree. In the regions that are warmer, the avocado plant is capable of surviving and staying outside in the summer. In case you are situated in a warm climate that does not exceed temperatures less than 45 degrees F, you can even move your avocado outside because the plant will certainly enjoy such weather conditions, which will ultimately encourage its growth. Avocado is a very potent, incredibly nutritious, and filling plant. It is rich in many minerals, vitamins, and different plant compounds, and is also beneficial for heart health and prevents arthritis. In case you are a person leading a healthy lifestyle, you can easily incorporate avocado into your diet. With all these great health benefits, is it no wonder that avocados are becoming such a popular choice for healthy dishes. Why not try some on your next salad or use them to top off a sandwich? Or make sure that guacamole is on the table when you’re serving chips or veggies as a side dish? You may be surprised at how healthy you will feel inside and how great your skin looks outside once you start adding avocados to your everyday diet.